Summer has arrived in Tampa, at time when homeowners consider the cost of operating their air conditioning systems. You may have already gathered the family and had “the talk.” You know the one we mean — the pep talk that is a delicate balance between encouraging your children to enjoy their summer break and taking steps to keep the house cool and comfortable. We all want our children to play outdoors and have a few friends over for ice cream. What we want to avoid, though, are outrageous utility costs that are the result of leaving doors and windows open while the AC is running. Luckily, And Services offers one service that will meet both of these goals — professional air conditioning maintenance services. Fins are the individual blades that you see on fans. In your AC unit, these fins can be damaged or bent. When the fins are not in tip-top shape, the air flow from the coils is disrupted or uneven. 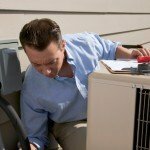 Your AC system needs to work longer to get the same amount of air through if the fins were not damaged. When the warm air comes in contact with the cool surface of the coil, the heat from the air is released. As heat is released, the air cools down. If the surface of the coils is dirty, the heat exchange process does not work efficiently, and your system has to run longer to cool the air inside your home. If a professional HVAC technician has not performed maintenance on your AC unit this summer, now is the time to contact us.